We have one of the strongest warranties in the industry. 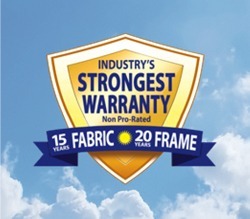 Our warranty covers all steal framework for 20 years and all fabric covers for 15 years. This is a non-prorated warranty. Our fabric is well known for its strength, durability and vibrant colors. 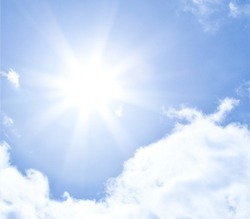 We use a high-density polyethylene material with ultraviolet additives that is breathable. 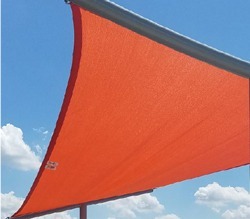 This means that our shade fabric mimics the natural shade trees by allowing air to flow through. This can cause a 20 degree temperature difference beneath. Our fabric also resists mildew and mold, which means very low maintenance for the life of the fabric. In addition, our advanced stitching thread is non-aging, carries a lifetime guarantee and will not rot from UV exposure or environmental causes. Our structures are designed with superior quality steal and are virtually maintenance-free. 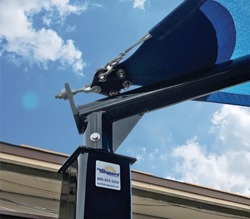 We design our structures to incorporate a clean and simple Quick Release System™. Only a standard wrench is needed to release the cloth. We also provide simple and accessible replacement parts. 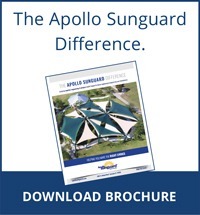 Apollo Sunguard Shade Cloth has been tested by an independent laboratory.  A large number of the colors meet a minimum of 93 percent UV Block as recommended by sun safety organizations and advocates. Our fabric passes the ASTM E-84 fire rating test and the NFPA 25 and NPFA 701. Our fabric is rated a Class 1 Material. We are an approved vendor to the Federal Government and have been awarded GSA contracts. We are proud to have our structures protecting government and military personnel worldwide. We also are a Service-Disabled Veteran-Owned Small Business.